It started with George Remensnyder's passion for wood. A third generation artisan, George worked out of his garage when he started his company eight years ago. When he outgrew the space, he purchased land, built a shop, and sought out other talented artisans to help him fill custom wood orders. George's wife Desirae left her teaching job to assist him in running the business. Despite George and Desirae's best efforts, they seemed to be living the E-Myth: "We were putting out fires all day long," Desirae recalls. The Remensnyders found Carolina Business Coach online, and, after first meeting with Harvey Smith, they felt a great sense of relief: "Immediately Harvey helped us pinpoint the real problem: like many entrepreneurs, we didn't have systems or processes in place." "When you're in your own business and completely overwhelmed as we were, you tend to be so hard on yourself. Harvey is such a great cheerleader, reminding us of how much we had already accomplished. That really pulled us out of it." "Harvey helped us regain control. With his help, we were able to organize our shop, scheduling and workflow, and accounting methods", adds George. Soaking up business knowledge like two stain-applying sponges, George and Desirae attacked marketing and networking concurrently. "Much of our business was in Sun City and locally in Lancaster; with Harvey's guidance we expanded into Home Show, trade associations and networking circles. We wrote letters to potential residential and commercial clients, and sat down with contractors to share our passion for quality work". What's emerged as your biggest learning? "Working with the assessments gave us a world of wisdom that we have applied and continue to apply to every area of our business." Could you be more specific? : "With our clients, we work with all kinds of personalities and we now have all kinds of communication tools and specific words we use to make sure everyone understands each other. It feels great to be able to build relationship with clients and suppliers and nurture our relationships and we haven't done that before . When you are used to doing things a certain way it is uncomfortable at first but then you realize the potential....It sounds so simple but there's an art to it--how to capture that moment." How else are you expanding the business? With a great staff in place, George has had more time to take on special projects for clients, like recreating heirloom pieces from photographs, and designing one-of-a-kind pieces from rare woods. Has this had an effect on your personal life? We took our first vacation this year since starting the business, thanks to Harvey's suggestion that we start to incorporate some balance. We're taking weekend trips this summer just to have a change of scenery and relax. Really relax! 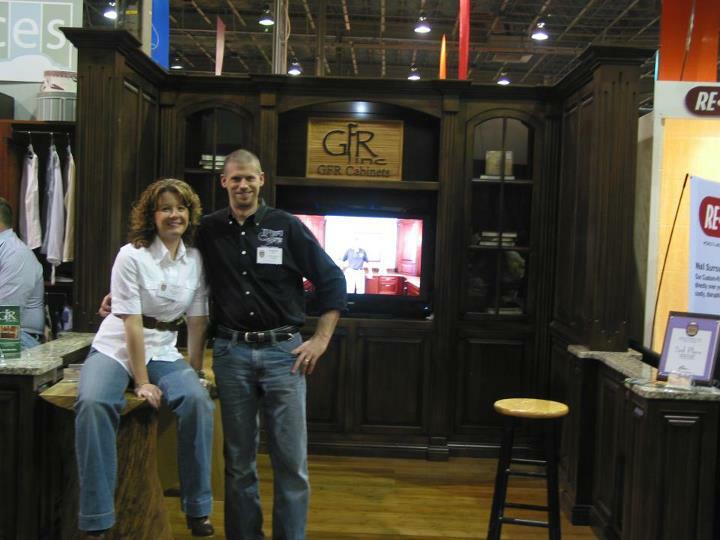 If you'd like to have exquisite cabinetry and furniture, call GFR.